I’m back at work today after a three-month leave. It feels weird to be sitting in my office instead of taking care of baby or sweating some renovation details. It seems today is also my boss’ birthday. Funny thing, her husband is a local blogger, but she doesn’t read his blog as a rule, just like my wife doesn’t read my blog. After a talk we had last year, my boss said she wouldn’t read this blog either, because we agreed it could produce some odd dynamics and also what’s the point of reading someone’s blog when you see them every day? 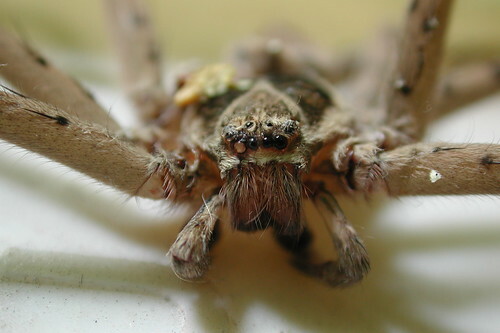 That’s a Huntsman spider, apparently, and we’ve seen a couple in our house recently. They give me the creeps. Boss Lady has a rather severe case of arachnophobia, and I wouldn’t want her to see these pix, because I know they’d upset her. But what’s the point of having a blog if you can’t show off amazing photos like these? Olivia was skeptical of having a female boss at first, but it turns out they’re both from Alabama and that was all she needed to become her biggest fan. I on the other hand was enthused from the outset because I love women and enjoy their company. However, I was not prepared for the change in how our office would celebrate holidays and birthdays. Olivia’s currently got the office decorated with about a thousand banners and trinkets and glittery whatnots. There’s a cake, and Olivia bought her a huge present. I’ve been told this is a gender-specific thing, and I can’t help but observe that we never did it up like this when we had a male boss at the helm. I’m generally skeptical of such generalizations, though. I’ve got a sense that my co-worker Janice, who’s very private, was more than happy with the low-key approach. Thing is, if you know the Boss Lady, although she has a very celebratory approach to life, you wouldn’t think she’d go in for this kind of stuff in a big way — but she does. She love it, apparently. For my part, I’m keeping my date of birth as a closely guarded secret because I don’t want a fuss made. So far so good: I escaped my 41st birthday unscathed. I missed my co-workers. It is good to be back. 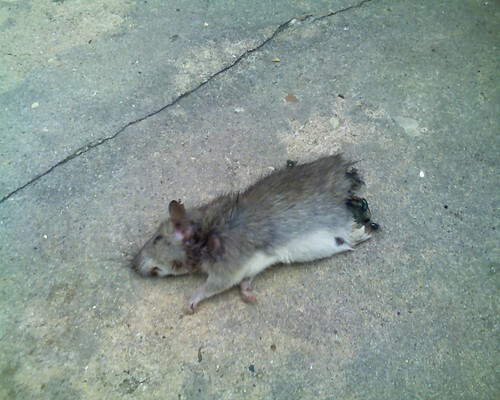 One of the cats left this by our back door. Hindquarters chewed off. Clearly left as a present. Maybe it was meant as a birthday gift for the Boss Lady? Geez, those photos are terrifying. Once in India I came back to my room to find a giant spider on the wall. It was four or five inches in diameter and was brightly colored in orange and red. I had to go grab a few friends, trap it in a blanket, and shake it out outside. 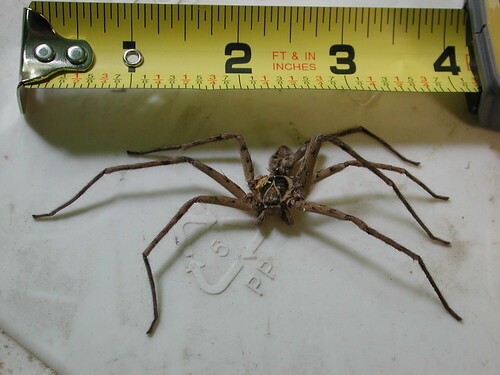 I don’t have a huge fear of spiders, but that one was so massive. Your pictures are far better than the ones on Wikipedia. Especially the second one! My husband doesn’t read my blog, either. He now assumes that darn near any friend of mine he doesn’t know right away who says, “Oh, HI, read so much about you!” is a blogging friend. all are neighborhood cats are lazy from being overfed by the old ladies on the block. are should read our , sorry. Sweet of the kitties to leave you the best part! Enjoyed having lunch with you yesterday. She whistled all day.